Well the Van Duzen 100 didn't quite go as planned. 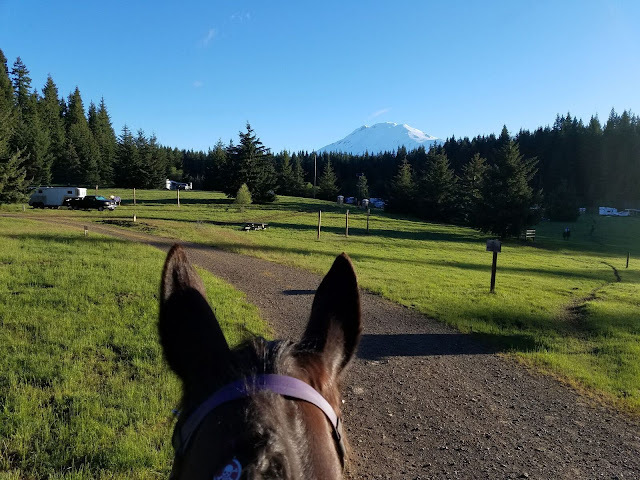 Weather was perfect, trail was wonderful (best footing I've ridden on all year). We rode down off the first ridge, along some pavement for a short while, then dropped down below a bridge to cross the river. I was a couple of minutes behind Carolyn Meier, since we slowed after a junior's horse slipped and fell on the slick pavement. Dropped down the steep wooded bank, saw Carolyn's footprints to the left and followed them. Unfortunately the trail actually went right (missed the ribbon) - we took three steps into some "slightly soft looking sand" and Fergus went down in the mud up to his belly. I came off the side and sank to my knees (and I was on the firmer stuff). The mud was so sucky I couldn't get my leg out without crawling on my hands and knees, so there was no way Fergus was getting out - there was just no bottom. Thank goodness I was able to divert our riding buddy Becky Batson behind me off to firm ground so she didn't also sink. She went around and Andrew Gerhard was right behind us and stopped and came running over. The junior with him, Desiree, held the horses while we tried to figure out what to do. Andy gathered branches to try and wedge underneath F, but they were too wimpy and the mud too deep (I was sitting in the mud behind him and pushing these things in and they were just going straight down). Every so often Fergus'd put in a huge effort and thrash around ... and get stuck even further. He was in a small stream, so constant cold water - and getting colder and colder. He started to shiver badly, buried in the mud, stuck on his side. Becky was holding a rope to his halter to try and pull him towards firmer ground when he did try to get out, but he was so strong he almost pulled her in a couple of times. I was behind him and almost ended up under him several times because I couldn't get out of the way - stuck in the mud myself. Shao-lan called the ride manager (note to self - ALWAYS preprogram the RM's phone number at a ride) and after 20 mins of trying to get him out on our own, I called 911 (tricky, since there's no cell reception out here - but I got a call out! And also tricky because I was so covered in mud I could barely get my touch screen to work). Got the dispatcher who thought "maybe we have a sheriff in Weaverville" - miles away . I told her I needed about six burly men with ropes RIGHT NOW or this horse was going to drown. She passed me to another dispatcher who took my details and said he'd call back. Sure enough 15 mins he called back - and by then the RM had arrived so was able to give better directions as to where we were on the road ("below steel bridge"). He said he had people coming from north and south, but gave no ETA, which scared me because I had no conception as to how long they might be and really wanted someone there RIGHT NOW TO GET HIM OUT. Bob Spoor stopped and loaned a sturdy rope with a carabiner. Pam (ride manager) couldn't figure out why we'd gone the way we had, because that route had been blocked. After poking around a little bit, she found bear tracks - a bear had gone through there and cleared the trail and she found his tracks in the mud. Carolyn followed his footprints, and Fergus (I'm guessing) followed Diamond's smell/I followed their footprints. I found out later that Carolyn and Diamond had also gone down in this bog, Carolyn went over his head, Diamond lay there for a short while then took a couple of lunges and got out. He's a smaller, more squirrelly horse than Fergus and I suspect was just a bit closer to firmer ground, while F kept working his way more and more into the sucky stuff. We tried dallying a rope to Michelle Coble's horse and he tried hard to pull F out, and nearly got flipped over backwards for his efforts. Becky said they got nervous when that horse started to sink, so abandoned the idea. I was frightened to death that they weren't going to get there in time. Each time Fergus thrashed, he was pushing himself towards where the creek got deeper and I was scared he was going to get in a position where his head went under and I'd have to go in and try to hold it up and we'd both end up drowning (you couldn't move in this stuff because it just sucked you in, so I was having a hard time getting out of his way when he started lunging). Andy continued to pile river rocks under him (for an HOUR!) to try and get some base under him, and we got some branches/logs under his head so it wasn't resting halfway in the mud. Andy even talked me down when I was getting really panicky at one point. We let F rest as much as possible, but every so often he'd try to lunge his way out, usually getting in a worse situation - leg over the rope, leg post holed into the sludge. He rotated his body through 360° in the process. Finally after an hour, the fire dept showed up - by then Fergus'd been in there about 1 hour 20 mins and was shivering violently. 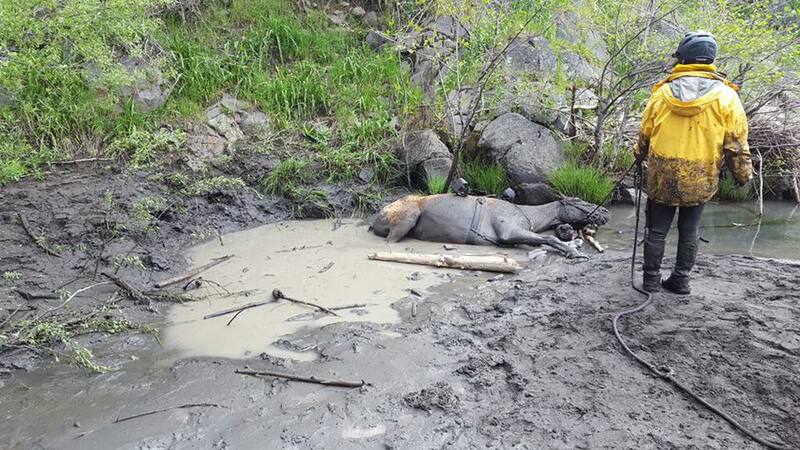 They attached a block and tackle to a tree and we hooked that onto his rope halter to at least stabilize him from going downstream (something Becky and I had been trying to do by hand for an hour - no, 160 lb people cannot hold 1250 lbs of horse). By then, the vet Dr Dan Chapman had arrived and so had us strip tack. We hadn't wanted to do that prior to this because we wanted to ensure they had something to hook to if needs be. In retrospect this original decision was probably a bad one - Dan said he felt the saddle (and the five tons of bags and junk and mud sodden rump rug on it) were stopping F be able to get out. Dan was also able to dig out his "downhill" front leg to get it free. I thought this leg was postholed straight down, but it was actually bent under him. And I suspect the mud was grittier where he was by then and not quite as suctiony as it had been higher up. Finally with a heroic effort - people and horse - and pulling and flailing he came up out of the mud and got enough traction to get onto the edge of the sand bar and was free. He came up like the monster from black lagoon, both of us covered from head to toe in grey slimy mud. Dan said the mud on his tail just plopped off like a blob. We took him over to where Ember was still standing patiently on the sand bar (we sent Andy + Jr on ahead as soon as the fire dept guys arrived) and he whickered at her "wow, that was scary!". And then we sent Becky and Ember on their way with instructions to "get it done" - this after she'd stayed with me for over an hour and half. Fergus then proceeded to whirl and bellow for his lost beloved (Ember)(Becky is my neighbor and we'd travelled to the ride together in my rig, along with her friend Debora who kindly agreed to crew for us). Thankfully someone also brought a horse blanket to cover Fergus' grey-mud covered body. The fire people were worried about me because apparently I was a bit of a funny colour. I was shivering from adrenaline-overload and the fact that I was covered in wet mud, had ripped one tights leg open from knee to crotch (that tight's leg now full of wet mud down to my shoes), sodden clothes, and shoes full of mud and water. They lit a little fire on the beach while we waited for the horse trailer to arrive, and made me stand by it. Fergus continued to bellow and twirl. Finally, when the trailer arrived, the fire people were kind enough to carry all my tack up to the road above (I followed the guy carrying my saddle, and it drizzled wet mud all the way up the road to the trailer). I asked Sharon if she was really sure she wanted me in her truck - but luckily she had a bunch of towels that I could sit on and a blanket to put around my shoulders (I stripped off the worst wet/muddy/sodden outer layers). Back at camp we stood the mud-sodden F in the sun, deblanketed him and let his mud-encrusted body dry. I stripped off my clothes and mud. Rinsed off as best I could and went over to deal with decrudding his body to check him over properly (vet Dan had checked him on the beach and he appeared to have no ill effects). Once I knocked the fine silt off I found a small abrasion on his elbow, one behind his ear, and a couple of places missing fur on his face. He looked a little stiff in his neck (no surprises - after being wrenched about). Once he was dry, clean and fed, Dan checked him again and confirmed the sore neck - but also confirmed no injuries or pulls to his legs after thrashing and yanking and being sucked in the mud. Many many thanks to all who stopped and helped, stayed with us, loaned equipment, loaned horse power, came and rescued us, came and fetched us. The endurance community (and fire dept) is a fine one. Special thanks to Andy who worked tirelessly for us - and took photos just before he left. I am thankful that we didn't lose Fergus or I, and that we just got away with a RO pull from Fergus' 9th 100 miler - 11.5 miles into the ride. That this didn't happen miles from a accessibility when Fergus had already gone 75 miles and would've been tired and less able to extract himself. I am thankful my phone worked when it needed to, and that we were literally 20 ft from the road when this happened - although it felt like we were a million miles away when it didn't look like we were going to get him out. And most of all, I am so thankful to get my big pone home safe and well. P.S. Becky and Ember completed the 75, after riding alone the rest of the day, dead last, hours behind the pack. Such a great job!